The rise of vegetarianism and veganism isn’t a trend to be overlooked. With the rising consciousness around the ethical and environmental impact of intensive farming practices, as well as the increased awareness around the health benefits of a plant-based diet, many people are making the switch. This is great news for the planet but can be tricky when it comes to catering events. After all, there are certain types of people who run a mile the second they hear the word ‘vegan’. So how can you cater an event in vegan stealth mode? Easy! With paella. 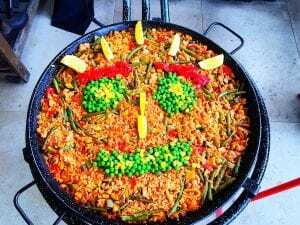 This dish lends itself to a range of modifications so you can serve a base vegan paella that will cater for vegans and vegetarians and if you have omnivorous guests to satisfy, you can always offer protein on the side. Are you looking for a foolproof vegan paella recipe? This is the one we use and we have catered for over 5,000 events with it. Add paprika, turmeric and mushrooms; cook, stirring, until mushrooms are tender. Add rice; stir to coat rice in vegetable mixture. Add tomatoes, 1/2 cup of stock and 1/2 cup of water; cook, stirring, until liquid is absorbed. Add remaining stock and water; cook, covered, stirring occasionally, about 1 hour or until liquid is absorbed and rice is tender.